EAST LANSING, Mich. (AP) -- Ron Zook and Illinois finally have a Big Ten victory to celebrate. For John L. Smith and Michigan State, the misery continues. A week after blowing a 16-point, fourth-quarter lead to Notre Dame, the Spartans became the first Big Ten team to lose to the Illini since 2004. Jason Reda's 39-yard field goal with 6 seconds remaining lifted Illinois to the 23-20 victory on Saturday. The Illini were 26-point underdogs. "I want them to understand that feeling and get hungry for that feeling and know that we've got to work harder to get some more wins," said Zook, in his second season as Illinois coach. The homecoming crowd often booed Smith and his players. "We didn't get the kids prepared to play the game," Smith said. "And if you go out unprepared emotionally and mentally, you're going to lose and you deserve to lose." The celebration for the Illini (2-3, 1-1) got a little testy, when they rushed to midfield to plant their school flag in the Spartan Stadium turf. Players from both sides briefly traded pushes and shoves before heading to their respective locker rooms. Zook apologized for the midfield incident. "Once again, it's part of learning how to win," he said. "We'll learn how to win and not do those things." The loss was the second straight for Michigan State (3-2, 0-1), its first to Illinois in 10 games and certainly no way to get over the sting of last week's 40-37 collapse against the Fighting Irish. Smith is 21-20 in his fourth year with the Spartans. He got a vote of confidence from university officials after last season, but they also made it clear more victories were expected. The Illini got a big lift from freshman quarterback Isiah "Juice" Williams, who made his second career start Saturday. Williams ran for 103 yards on 17 carries. He also completed nine of 16 passes for 122 yards and a touchdown, with one interception. Illinois led 20-10 entering the fourth quarter. The Spartans cut the lead to 20-17 with the help of a video replay that reversed a fumble call and kept a drive alive inside the Illini 20. After the review, officials ruled that quarterback Drew Stanton's arm had started to move forward and the play was ruled an incomplete pass. On the field, officials had ruled that Illinois' Doug Pilcher had forced and recovered the fumble. Stanton was hurt on the play and was replaced by backup Brian Hoyer. Jehuu Caulcrick scored on a 1-yard TD plunge to cap the drive with 6:42 left. Stanton has bruised ribs. Illinois couldn't move the ball on its next possession, and Michigan State kicker Brett Swenson connected on a 27-yard field goal with 2:46 left to tie the score at 20. Williams then engineered a 10-play, 58-yard drive to give Reda a shot at the game-winning kick. The key play: an 8-yard pass to Kyle Hudson, moving Reda into better range. "We're the fighting Illini, not the lay-down Illini," Williams said. Reda said he was focused only on the winning kick -- not the Illini's recent conference woes. "I was trying to block everything out and just put the ball through the uprights," he said. "I wasn't thinking about anything except doing what I know I can do." Pierre Thomas had 110 yards on 18 carries for the Illini, whose last Big Ten win before Saturday was Nov. 6, 2004 -- a 26-22 victory over Indiana. Illinois had lost 24 of its last 25 conference games entering Saturday, and gone 5-28 in Big Ten games since winning the conference title in 2001. Jacob Willis caught two TD passes for the Illini. SOUTH BEND, Ind. -- For the first time in more than 30 years, Notre Dame will make 5,000 season tickets available to football games starting next season, charging a fee to help pay for more than $40 million in repairs to Notre Dame Stadium. The tickets will be offered first to alumni, donors and others affiliated with the university ahead of the general public, Notre Dame's executive vice president John Affleck-Graves said Thursday. Within hours of announcing the season-ticket sale, the university had received at least 750 requests for applications. Affleck-Graves said if more than 5,000 applications are received from those affiliated with the university, the tickets will be distributed by lottery. In addition to the cost of a season ticket, which is $413 this year, there will be an annual fee of $2,000 per ticket for sideline seats; $1,500 per ticket for seats in the corner of the stadium; and $1,250 per ticket for end zone seats. The revenue generated through the ticket plan will help pay to repair and maintain the 76-year-old stadium, which was expanded to 80,795 seats before the 1997 season. Extensive work is needed in the concrete seating bowl because of freeze-thaw damage. Major work is expected to begin next summer. The university decided against adding luxury boxes or allowing corporate signs inside the stadium. "We thought if we put in luxury boxes, it would change the look and the feel of Notre Dame Stadium," Affleck-Graves said. "We think our alumni body likes the comfort of the traditional feel in the House that Rockne Built." Affleck-Graves said the university did not want to use endowment money or seek donors because that could take away from academic fundraising. He said none of the new season tickets will be drawn from those now available in the general alumni lottery. The season tickets will come from those that have been returned over the past several years, along with a reduction in tickets distributed to visitors through the academic departments, the university relations office and the university president's office. A waiting list for the potential future sale of season tickets will be established after the current allotment has been sold. The additional 5,000 season tickets will bring the total to between 20,000 and 25,000. Season-tickets holders already pay a building fund fee, which this past year was $350. Affleck-Graves said that fee will go up periodically. The university also announced Thursday that it is revising how it distributes tickets to make more tickets available to alumni through its annual lottery. HOUSTON (AP) -- Rice will play its scheduled game against Army on Saturday, despite the death of defensive back Dale Lloyd. "We're going to press on," coach Todd Graham said Tuesday. "We're going to honor Dale on how we do everything the rest of the season." Lloyd, 19, collapsed on the field about 5 p.m. Sunday during a light workout but was conscious when taken to a hospital by ambulance. He died about 9 a.m. Monday, school officials said. An autopsy was pending. When Rice takes the field against Army, Lloyd's No. 39 will be affixed between the Owl wings on the players' helmets. The team will also take Lloyd's jersey to each of the games, and plans to present it to his parents at the end of the season. A heartbroken Graham said Tuesday that when he learned of Lloyd's death, he didn't care about the game. But after talking to his players and several current and former coaches, including Florida State's Bobby Bowden and Bobby Ross of Army, he changed his mind. "I just went through a lot of emotions there. At first I didn't even think about it," Graham said. "I've had some people talk to me. I called our 15 captains into a room, talked to Dale's parents, and the consensus was let's press on. That's the best thing for our kids to get back out there on the field and have some semblance of normalcy." Lloyd played in Rice's season opener against Houston but didn't take part the last three games. The team planned to redshirt him this season. Southern Califronia wide receiver Dwayne Jarrett is likely to miss two to four weeks with a sprained shoulder, coach Pete Carroll said Sunday. Jarrett, who finished with four catches for 36 yards, left the No. 3 Trojans' 20-3 victory over Arizona on Saturday in the third quarter. Earlier in the quarter, Jarrett caught his 32nd career touchdown pass to tie Stanford's Ken Margerum for the Pac-10 record. "We'll miss him tremendously," Carroll said. "But the fact that Patrick [Turner] is ready to go is good. He and Vidal [Hazelton] will pick up the slack. But we're losing the all-time touchdown catcher in the history of the Pac-10, so that's quite a loss." Jarrett, who has 20 receptions for 207 yards and three touchdowns this season, is technically listed as doubtful for next Saturday's game at Washington State, Carroll said. BLACKSBURG, Va. -- Virginia Tech defensive end Chris Ellis and split end Josh Morgan have been suspended for violating team rules and will miss the game Saturday against No. 24 Georgia Tech. Coach Frank Beamer made the announcement on Monday. Ellis is one of the No. 11 Hokies (4-0) most disruptive defensive linemen, recording 12 tackles this year, including one sack. Morgan is Tech's second-leading receiver, with 10 catches for 161 yards and two touchdowns. He blocked two punts, including one for a safety in the Hokies' 29-13 victory over Cincinnati on Saturday. Tyrone Willingham's getting his just due this year. First, Notre Dame, which unceremoniously ousted him, was clobbered by Purdeue and was then lucky to get by Michigan State, which seems to find one big game to choke in each year of the last three years. Second, his Washington Huskies not only battled back from being down 16 zip against UCLA, but won the game 29-19, their first home victory over a Pac-10 power since the year 2000. Now Washington's slowly rebuilding that swagger they were once known for, and it's been a long time since I've seen the TV camera shake from the vibration of thousands of cheering stomping fans at a Huskies game. 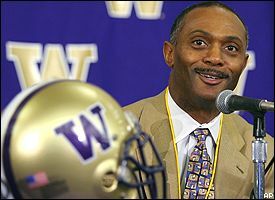 Give Tyrone his accolades: Washington's 3 and 1, and with just three more wins are bowl eligible. I went to this game, which started out as a nail-biter, then turned into a rout. After Cal went to a kind of 4-4-3 look on defense, and stuffed the Sun Devils running game, the men in burnt orange were forced to turn to their passing game, which was notable in scheme, but terrible in execution. EAST LANSING, Mich. -- Trailing by 17 points at halftime, Notre Dame faced a sobering reality: A season that began with so much promise was about to be derailed by a second straight defeat. Coming off a blowout loss to Michigan, the Irish looked beaten again -- still down 16 going into the fourth quarter. Meanwhile, Michigan State looked unstoppable in front of a fired-up crowd. "I think that at halftime the guys realized the season was starting to fall away for us," Notre Dame coach Charlie Weis said. "Everyone could feel the same thing. After the game we played last week, and now we're down big at halftime ... it was basically 'Hey fellas, what's it gonna be? Are we just going to be a bunch of also-rans or are we going to come out here and give it a chance to win the game?'" In stunning fashion, the Irish stepped up. Cornerback Terrail Lambert capped a furious rally by returning an interception 27 yards for a touchdown with 2:53 remaining to give the 12th-ranked Fighting Irish a 40-37 victory over the Spartans on Saturday night. The loss shocked Michigan State (3-1) and its fans, who remained in the stands despite heavy rain in the second half, convinced they were going to see the Spartans beat the Irish (3-1) for the eighth time in 10 meetings. Lambert made sure of that, following up his score by ending the Spartans' hopes moments later with a juggling interception of Drew Stanton's pass in the closing seconds. "Late in the game, I made some stupid mistakes," Stanton said. That the decisive plays came from the Irish defense, exposed in the loss to the Wolverines and for much of the game Saturday, may have been the biggest surprise. But the Irish offense also clicked late, led by quarterback Brady Quinn. Quinn started slow, going just 2-of-8 for 6 yards in the first quarter as Michigan State jumped out to a 17-0 lead. But he finished 20-of-36 for 319 yards with five TDs against one interception. "Give all the credit to Notre Dame," Michigan State running back Javon Ringer said. "They stepped up when they had to." The Irish trailed 37-21 entering the fourth quarter. But Quinn threw TD passes to Jeff Samardzija (43 yards) and Rhema McKnight (14 yards) to cut the lead to 37-33 with 4:57 remaining. McKnight's score was set up by another big play from the defense. Notre Dame safety Chinedum Ndukwe stripped the ball from Stanton and recovered it at the Michigan State 24 with about six minutes remaining. Michigan State's Jehuu Caulcrick finished with 111 yards and a TD on eight carries. Stanton ran for 53 yards, and completed 10 of 22 passes for 114 yards. He had two TD passes and the two interceptions. Michigan State looked like it might continue its recent good fortune against the Irish, which included a 44-41 overtime victory in South Bend last year after which a few Spartans planted a school flag near midfield. The Spartans led this one 31-14 at halftime and looked as if they should be preparing for another postgame celebration. It was all Michigan State early, as the Spartans rolled up 260 yards of offense in the first half. After forcing a Notre Dame punt, the Spartans scored on a three-play, 73-yard drive on their first possession. The drive was capped by a 34-yard touchdown pass from Stanton to Kerry Reed. Notre Dame's Tom Zbikowski fumbled a punt that Michigan State's punter, Brandon Fields, recovered at the 50. The Spartans scored on a trick play, with receiver Matt Trannon throwing a 26-yard TD pass to a wide-open Ringer. Brett Swenson added a 32-yard field goal late in the first quarter to make it 17-0. But the Spartans struggled in the second half as turnovers and penalties cost them. "We just made two many mistakes when it counted," Michigan State coach John L. Smith said. "We couldn't sustain drives." The teams were meeting for the 70th time and Notre Dame holds a 44-25-1 edge in the series. This year also marks the 40th anniversary of the famous 10-10 tie between the two programs, the 1966 "Game of the Century." The Spartans retired the No. 95 jersey of defensive end Bubba Smith, a star of the '66 team who was picked No. 1 overall by the Baltimore Colts in the 1967 NFL Draft. Weis said after the win that he would give Ara Parseghian, the coach of Notre Dame's 1966 team, a ball from Saturday's game. ATLANTA (AP) -- Calvin Johnson's left leg was hurting. He wasn't sure if he'd be able to play until he went out for warmups. Then he went out and had the best game of his Georgia Tech career. Shaking off a sore quadriceps, Johnson caught touchdown passes of 66 and 58 yards on the way to piling up 165 yards receiving, leading the Yellow Jackets past feeble Virginia 24-7 on Thursday night. "It was real sore and tight," said Johnson, who had the two longest touchdowns of his career and set a personal best for yards in a game. "But once the adrenaline got started, I didn't worry about it. I was feeling no pain." Johnson barely practiced during the short week after injuring his leg in Saturday's victory over Troy. His status was listed as a game-time decision, the coaches wanting to know how he felt while warming up. Johnson did some light running, got a last-minute massage from the trainers and proclaimed himself ready to play. "I think he was less than 100 percent," coach Chan Gailey said, "but obviously he had a great night." Burning the Cavaliers twice when they attempted single-coverage on the star receiver, Reggie Ball hooked up with Johnson on touchdown passes of 58 and 66 yards to give the Yellow Jackets (3-1, 1-0 Atlantic Coast Conference) a commanding lead by early in the second half. "When I see one guy in front of me, I'm like, 'Shoot, I love it," Johnson said with a smile. Of course, any lead looked safe against Virginia (1-3, 0-1), which had three straight wins in the series but managed just 166 yards and nine first downs with redshirt freshman Jameel Sewell becoming the Cavaliers' third starting quarterback of the season. Sewell's inexperience definitely showed in his first career start. He looked jittery in the pocket in the first half, bouncing numerous passes at the feet of his receivers. Late in the game, he threw two interceptions in a desperate attempt to rally the Cavaliers. "I was not nervous," Sewell insisted. "I had no fear. My teammates had faith in me." Ball, who set a school record for quarterbacks with 130 yards rushing against Troy, did a little bit of everything. On the Yellow Jackets' second possession, the senior handed off to fullback Mike Cox, then drifted out of the backfield to haul in a 17-yard pass. Ball might have scored, but he slipped at the 5 trying to make a cut. Not to worry. After a penalty backed up Georgia Tech, the quarterback picked up 4 yards on the option, then scored with a 6-yard run around left end. Johnson made a key block in the end zone on linebacker Jon Cooper. Travis Bell kicked a 47-yard field goal for a 10-0 lead and the Yellow Jackets used up their timeouts late in the first half to get the ball back. Ball wasted no time looking for his big receiver. Inexplicably, the Cavaliers put one man on the 6-foot-5 Johnson, who blew by Jamaal Jackson after a quick feint to the outside and hauled in the 58-yard score down the middle of the field before safety Byron Glaspy could get over to help. Johnson easily pulled away from the defenders, sticking out the ball with his right hand as he glided into the end zone with 1:08 left in the half. Ball and Johnson pulled off an even bigger play the next time they got their hands on the ball. On Georgia Tech's first possession of the second half, Johnson froze Marcus Hamilton with a quick stutter-step along the sideline, then got safety Tony Franklin all twisted up by cutting to the inside for the 66-yard TD -- the longest reception of Johnson's career. The junior eclipsed his previous career high for receiving yards, a 131-yard effort against Connecticut in 2004. Until Thursday, Johnson's longest touchdown catch was a 42-yarder last season, also against UConn. Ball finished 10-of-19 for 205 yards, giving the Yellow Jackets plenty of confidence heading into their next game, an ACC showdown against No. 11 Virginia Tech. Last season, the Hokies routed Georgia Tech 51-7. "You don't get over it, especially a loss like that," Ball said. "We've got to practice that much harder next week because we know what we're facing." Virginia, coming off a home loss to Western Michigan, avoided a shutout when Sewell tossed a 16-yard touchdown pass to Kevin Ogletree on fourth down with 12½ minutes remaining. The Cavaliers needed help from Georgia Tech's Tashard Choice, who fumbled the ball away at his own 29. "A touchdown will give you confidence, no matter what," Sewell said. "It lets you know you can do it again." Even so, Virginia has managed just 43 points this season -- an average of less than 11 per game. Coach Al Groh said he's committed to helping Sewell develop as the No. 1 quarterback. "He's got some elusiveness in the pocket, which a quarterback on this team right now needs to have," Groh said. "We knew well back in time that this was what it was going to come to, and we're going to follow through." GAINESVILLE, Fla. -- No. 5 Florida could be without its best defensive lineman for five games, including a key stretch of Southeastern Conference games against Alabama, LSU, Auburn and Georgia. According to several radio and newspaper reports, defensive tackle Marcus Thomas has been suspended five games for failing a second drug test. Thomas, a senior from Jacksonville who leads the team with three sacks, spent part of Wednesday in meetings with school officials to appeal the suspension he received earlier this week for marijuana use, the Orlando Sentinel reported on its Web site. Thomas' mother, Sheila Mote, told the newspaper her son tested positive twice for marijuana between the middle of July and the end of August. But she and her son believe both results indicate only one use of the drug. "Basically, we think he's being hit with double-jeopardy," she said. "He's being hit twice with the same mistake. I'm behind him 100 percent." Mote said her son ingested marijuana at a party this summer. When he returned to campus in July, he failed a first drug test, which prompted school officials to suspend him for the season opener. A second test, which Mote said came three to four weeks after the first, also came back positive. According to the school's substance-abuse policy, Thomas was suspended for 50 percent of the season. Coach Urban Meyer refused to confirm Thomas' suspension Wednesday on the Southeastern Conference teleconference. "That's something I'll address at the appropriate time," Meyer said. Thomas has the right to appeal any suspension to athletic director Jeremy Foley. Athletes are allowed to present circumstances that might have influenced the test. Under the policy, Foley then makes a recommendation to the Substance Abuse Committee, which handed down the original suspension, about whether to change the conditions of the punishment. NORMAN, Okla. (AP) -- The Pacific-10 Conference, finding merit in Oklahoma's complaints about the officiating in its loss to Oregon, issued a one-game suspension Monday to the officiating crew and the instant replay officials who worked the game and an apology to the Sooners. The Ducks won the game 34-33 after scoring two touchdowns in the final 72 seconds. "Errors clearly were made and not corrected, and for that we apologize to the University of Oklahoma, coach Bob Stoops and his players," Pac-10 Commissioner Tom Hansen said in a statement. "They played an outstanding college football game, as did Oregon, and it is regrettable that the outcome of the contest was affected by the officiating." After the Sooners' practice Monday night, Stoops said the apology brought him no satisfaction. "At least they have reacted to it and tried. Truly there can be no amends to it and it can't be corrected," Stoops said. The loss was Oklahoma's first of the season and immediately lessens the Sooners' chances of making it to a third BCS title game in four years. "I've made a million mistakes. I'll make a million more in each game, and in that game included, I wish there were things I could have done differently or changed," Stoops said. "Unlike officials, players and coaches don't have that opportunity. They had an opportunity to get it right and they chose not to. So I find it still absolutely inexcusable and unacceptable. Two plays were reviewed on Oregon's game-winning drive -- an onside kick that gave the Ducks possession and a pass interference call one play before Oregon's winning touchdown. Hansen said the onside kick was touched by an Oregon player before it had traveled the required 10 yards, and, therefore, the ball should have been awarded to Oklahoma. The video also shows an Oklahoma player actually recovered the ball, although that aspect of the play was not reviewable under the instant replay rule. "The fact that the errors on the onside kick altered the outcome of the game is most unfortunate and unsettling," Hansen said. "We had a solid veteran crew assigned, and the instant replay official had a fine career as a referee in the Pac-10. "We believe in the ability and integrity of each individual involved. It should be noted that not all of the seven officials were directly involved in the play in question, but the entire crew bears responsibility for every play. Game officials and replay officials have positions of great responsibility and must be accountable for their actions." Stoops has also said he believes Oklahoma defensive end C.J. Ah You tipped a pass by Dennis Dixon that resulted in a pass interference penalty. If the ball was indeed tipped, the pass interference penalty would have been negated. The replay officials ruled that they didn't have indisputable video evidence that the ball had been tipped. Hansen said that the future work of the officials who were suspended will be closely monitored. "The training and experience of officials at this level enable them to work at a high degree of accuracy," he said. "Unfortunately, at the critical moment of this game, errors were made." University of Oklahoma president David Boren sent a letter Monday to Big 12 commissioner Kevin Weiberg, saying the officiating problems was beyond an "outrageous injustice," and asking him to pursue having the game eliminated from the record books and having the officials involved in the game suspended for the remainder of the season. Weiberg responded with a statement saying the result of the game would stand. "There is no provision under NCAA or conference rules for a game result to be reversed or changed as a result of officiating errors, nor do I believe there should be," he said. "This policy is well known nationally and institutions, including OU, know this to be the case at the time of entering into contracts to play Pac-10 opponents," Weiberg said. Boren, in a statement issued after the conference statements, expressed appreciation for the Pac-10's actions. "I hope this will lead to further national review of the responsibilities of replay officials and the way in which they interact with game officials on the field," Boren said. "I also hope this situation will lead the Pac-10 to change their policy of requiring that only officials of the Pac-10 officiate the home games of Pac-10 universities when they are hosting a non-conference opponent." OKLAHOMA CITY -- Oklahoma coach Bob Stoops said Sunday he was "incredibly disappointed" after reviewing videotapes of a disputed onside kick and pass interference penalty from the Sooners' last-minute loss to Oregon. Stoops said he believes an Oregon player interfered with Oklahoma's chance to recover an onside kick by touching the ball before it traveled 10 yards. The play gave Oregon possession and set up the Ducks' game-winning drive. He also said an Oklahoma defender tipped a pass by Oregon's Dennis Dixon, and Sooners safety Darien Williams should not have been flagged for pass interference on a play that set up the Ducks' winning score. "The instant replay was brought up to eliminate issues like this. And here, there are a number of issues that are clearly -- looking at video -- wrong," Stoops said Sunday. On the onside kick, Oregon's Brian Paysinger jumped in front of Oklahoma's Malcolm Kelly and appeared to knock the ball forward to a group of players from both teams. Officials ruled that an Oregon player recovered the ball and was down before the ball squirted out to Oklahoma's Allen Patrick, who picked it up. "I see my guy stepping up inside of 10 yards to go up and gain reception, gain possession of the football, I see their guy go in front of him and hit the football before my guy is allowed to at 10 yards and I see him collide with my guy inside of 10 yards as well," Stoops said. "That's illegal touching and interfering with the reception. And then I see my guy get up with the football that's laying on the ground." Two plays later, defensive end C.J. Ah You tipped Dixon's pass to Paysinger that resulted in a pass interference call against Williams, Stoops said. Immediately after the penalty, Dixon found Paysinger wide open in the end zone on a 23-yard pass to give Oregon the lead with 46 seconds left. As time expired, Oregon blocked Garrett Hartley's 44-yard field goal try that would have given Oklahoma the win even after all the controversy. Stoops said he hopes the sequence does not lead to the downfall of instant replay. "I would hope not," Stoops said. "Even though they acted as they did, at least the whole country and everybody sees what was ... and what really happened." Pacific 10 commissioner Tom Hansen said the conference will review the onside kick and pass interference plays and announce Tuesday whether they were called correctly. "I imagine they'll have some kind of reply to the what the issues are and that'll be it," Stoops said. Stoops said he believes Oklahoma's administration will also pursue any avenues for a review of the plays. "In the end, it isn't going to change anything," Stoops said. "In the end, I've got to look at a bunch of kids who fought hard and have a loss right now." It's the second time in a span of six games that an Oklahoma loss has been clouded by controversy. In Oklahoma's last previous loss, three of the 12 plays on Texas Tech's game-winning drive last November were reviewed using instant replay - including a 2-yard touchdown run by Taurean Henderson that gave the Red Raiders the lead. Video replays on whether Henderson extended the ball across the goal line were also deemed inconclusive. 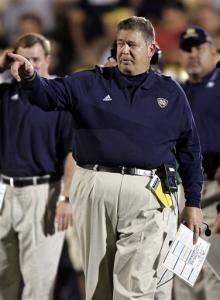 "They deserve their just due," Irish coach Charlie Weis said. "I think it's important to understand that team just came and whupped us pretty good." Indeed, they did. Chad Henne threw three touchdown passes to Mario Manningham, and Michigan intercepted Brady Quinn three times, forced him to fumble and shut down the rest of the Irish offense. Michigan ended a two-game losing streak against the Irish and a three-game slide at Notre Dame Stadium. The win likely silenced doubters who questioned Michigan after a 7-5 season and two less-than-impressive wins to open this season. "This was going to be our big test," said LaMarr Woodley, who returned a fumble 54 yards for a touchdown. "We passed the test today." Prescott Burgess intercepted Quinn on the second play of the game to set the tone. Michigan (3-0) was ahead 26-7 before the Irish (2-0) had their initial first down. The 47 points were second only to the 51 scored at Notre Dame by Purdue in 1960. "They stopped us in the passing game. They stopped us in the running game. They beat our defense. They really just beat our complete team," Irish tailback Darius Walker said. "It was a complete team loss." The win had to be a relief for Michigan coach Lloyd Carr. He's been under fire for failing to win big games the past two seasons -- twice in bowl games, and twice each to Notre Dame and Ohio State. Carr, now 4-1 against No. 2 teams and 16-6 against top 10 teams, called the win "special." "The credit sure doesn't go to me," he added. "Those guys out on the field, they played the game." For Notre Dame, the loss was another setback on its road to restore its storied program. In 2000, there was a 41-9 loss to Oregon State in the Fiesta Bowl when the Irish were No. 10; three years ago it was a 38-0 loss to Michigan; and last year it was a 34-20 loss to Ohio State in the Fiesta Bowl when the Irish were ranked No. 4. Weis said he never saw a rout coming. "I was surprised that we collectively, from me on down, laid an egg," he said. "I expected us to have a better performance." It was just the eighth time the Irish have given up at least 40 points at home. The Wolverines jumped on Notre Dame mistakes, including a pass that sailed through the hands of tight end John Carlson to Burgess, who returned it 31 yards for a touchdown. Then Manningham was left open for a 69-yard touchdown catch and David Grimes fumbled a kickoff return that set up a 2-yard TD run by Mike Hart, who finished with 124 yards on 31 carries. Henne then threw TD passes of 20 and 22 yards to Manningham to make it 34-7. The 34 points were the most allowed in a half by Notre Dame since 1998 when the Irish gave up 42 points in the first half in a 45-3 loss at Michigan State. The 34 first-half points by an opponent were the most since Purdue scored 45 in its' 51-19 win in 1960. Quinn, touted as the Heisman Trophy favorite, was just 3-of-13 passing for 14 yards before going 7-of-7 for 71 yards in leading the Irish to a touchdown drive just before halftime, cutting the score to 34-14. Michigan held Notre Dame to 4 yards rushing on 17 carries and 245 total offense, 1 yard more than the Irish had against Michigan last season in their worst offensive output under Charlie Weis. The difference Saturday is Notre Dame gained most of its yards well after the game was decided. Notre Dame's two top receivers, Jeff Samardzija and Rhema McKnight, didn't have their first catches until Michigan was ahead 34-7. Hart had his third straight 100-yard game. The Wolverines improved to 12-1 in games when he runs for 100 or more yards. It also was a big day for Henne, who last season was heavily criticized for his performance in Notre Dame's 17-10 victory. "We knew we had a great team and we showed it today," Henne said. Henne got off to a rocky start Saturday, throwing a pass that was picked off by Chinedum Ndukwe. Ndukwe returned it 51 yards to the Michigan 4 to set up Notre Dame's first score. But he finished the day 12-of-22 for 220 yards. Quinn, who has never had a big game against Michigan, struggled again. "With as many mistakes we made as a team, I don't think anybody would have overcome that," Quinn said. Carr said the Wolverines dealt with a difficult offseason well, now it's time to see how they deal with some prosperity. "Our challenge now is to understand that you got to get ready to play every week," he said. 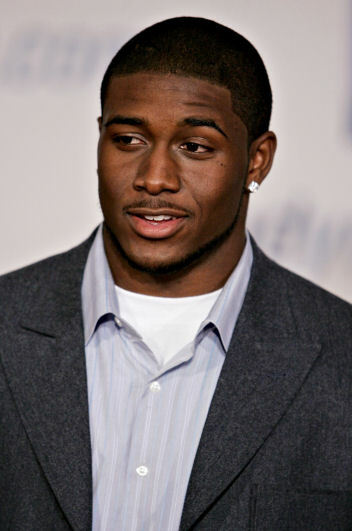 Reggie Bush insisted Friday he and his family have done nothing wrong, responding to allegations that they accepted gifts, money and other benefits from two marketing agents during his career at USC. "I'm not worried about any of these allegations or anything like that," Bush said. "Because I know what the truth is, like I said from day one. Once the smoke clears, everybody's going to see we did nothing wrong." Bush and his family "appear" to have received more than $100,000 in financial benefits from marketing agents while Bush played at USC, according to a report posted Thursday night on Yahoo! Sports. The Web site reported that the benefits, which could lead the NCAA to retroactively declare Bush ineligible and level sanctions against the Trojans, were supplied by two groups that were attempting to sign Bush as a client. Bush also could be stripped of his Heisman Trophy. The BCS, which controls the postseason in Division I-A football, said it will wait for the facts before making any decision regarding Reggie Bush and USC. "The BCS is not an investigative body, or a governance body," BCS coordinator Mike Slive told ESPN.com's Ivan Maisel. "It's designed to put together a championship game. What we said earlier this year is that once the NCAA and the Pacific-10 Conference processes are complete, if there are findings of wrongdoing, we will determine if any actions are appropriate. There isn't anything we could do at this point." Asked if possible penalties might include vacating the BCS Championship, paying back the money awarded for playing in the game or banning USC from future participation in the BCS, Slive said, "Without having facts, I'm not going to speculate." BCS administrator Bill Hancock said Friday that the commissioners of all 11 Division I-A football conferences and Notre Dame discussed at an April meeting in Phoenix what would happen if the NCAA vacated USC victories from the 2004 national championship season. "We will wait and see what happens," Hancock told ESPN's Joe Schad. "There is not yet a plan in place for this scenario. If the NCAA rules for violations and penalties, the conferences and Notre Dame would have to discuss what action to take." Mike Ornstein, Bush's current marketing agent who is alleged to have paid financial benefits, denied wrongdoing, telling Yahoo! that accusations of cash payments are lies. "Obviously it does affect you just because it is out there," Bush said. "But at the same time I know there's nothing to worry about. "It makes you want to go out there right away and tell your side of the story. Show everybody the facts, the truth. But you can't do that. That wouldn't be the right way to do it." • Suits for Bush's stepfather and brother to wear during the Dec. 10, 2005, Heisman ceremony in New York, a makeover for his mother for the event and limousine transportation -- all paid for by Ornstein. • Two hotel stays by Bush, one in Las Vegas and another in San Diego, in March 2005. In both instances, the rooms were paid for by Michael Michaels, a marketing agency investor who wanted to represent the football star. • $13,000 from Michaels' fledgling firm, New Era Sports & Entertainment, to purchase and modify a car for Bush. • $595.20 in round-trip airfare from San Diego to Oakland in November 2005 for Bush's stepfather, LaMar Griffin, his mother, Denise Griffin and younger brother to attend the USC-California game at Berkeley. The charges were put on a credit card belonging to Jamie Fritz, one of Ornstein's employees. Rob Whalen, director of the Heisman Trust, said Friday morning that the organization would have no comment about the latest Bush report. The members of the Heisman Trust are not expected to make any decisions until after the NCAA completes its investigation. No player has ever had a Heisman Trophy revoked. If it is ruled that Bush should have been ineligible to play at the time of balloting, his eligibility for the trophy would be in serious question. The Heisman ballot states that the recipient must be in compliance with NCAA bylaws. "Reggie Bush never received an extra benefit from Mike Ornstein other than what he was allowed to get from the NCAA when he worked with us," Ornstein told Yahoo! Bush was an intern at Ornstein's marketing company in the summer of 2005. Ornstein told the Web site that he believed the funds given to Bush's family by Fitz were a loan that was repaid. He also told Yahoo! he had "no idea" if such a loan would violate NCAA rules. NCAA rules state that players and their families may not receive loans or benefits from agents. Neither Ornstein nor Bush's attorney, David Cornwell, returned phone messages from The Associated Press left late Thursday and Friday. Michaels' attorney, Brian Watkins, said his client was traveling Friday and unavailable for comment, but Watkins claimed the Yahoo! report was "very accurate." "We've known what [Bush] was doing. This article proves fraud on his part and his family's part. He never intended to go forward with my clients. He was always taking money from Mike Ornstein and then representing with my clients that he was going to go forward with this business venture," Watkins said, referring to New Era. "It was fine for him to go with the other venture, but his job was to notify my clients that he was on the payroll with Ornstein. But he said the opposite. He continued to do that and took money from my client." Speculation over whether Bush and his family received money arose earlier this year in reports that his mother and stepfather didn't pay $54,000 in rent during the year they lived in a house owned by Michaels, who later said the family promised to repay him once Bush went pro. Pacific-10 Conference Commissioner Tom Hansen said that, to his knowledge, the conference did not have information regarding Yahoo's report on Reggie Bush. "We will make inquiries as part of our investigation of this matter," he said. "It's something we're continuing to look at to see if there are future developments." He said there was no timeline for the Pac-10's investigation. "It's impossible to say because of threats of litigation, which we understand have been exchanged among the parties," he said. "Therefore, the presence of legal counsel advising the parties to not discuss the situation makes it impossible to say when an investigation might be completed." The NCAA and Pacific-10 Conference are investigating whether any rules were broken when Bush's family lived in the home. "Now that certain individuals have spoken publicly, we hope they will now speak with the NCAA," the organization said in a statement Friday. Cornwell also said earlier this summer that FBI agents interviewed him about "potential federal crimes" by phone in June. The FBI would neither confirm nor deny whether a federal investigation was ongoing. The NFL players union also is investigating the rent payments. In a statement released by USC counsel Kelly Bendell, the school said it is cooperating with the probe but "cannot comment on any matter that is the subject of an ongoing NCAA and Pac-10 investigation." Saints spokesman Greg Bensel told the AP the team would not comment on matters involving Bush when he was in college. "It doesn't involve the Saints," he said. The allegations would have no effect on Bush's professional football career, a person within the NFL with knowledge of Bush's standing in the league told the AP. The source asked not to be named because of the sensitivity of the situation. Bush, the second overall pick in the NFL draft in April, said he has been in touch with USC officials. "I told them the same thing, don't worry about anything," he said. "If there was something to worry about, then I would tell you. But there's nothing to worry about." In New Orleans, Saints wide receiver Joe Horn defended his teammate. "I don't think Reggie did that, but if he did, I would have done it, too," Horn said. "And guess what? Eighty percent of the college athletes that don't have much when they're in college get money, too. So they should ban all of them. They should go after everybody. Don't just go after Reggie because he's Reggie Bush." Yahoo! Sports has made some great moves to place itself more in the middle of the sports Zeitgeist and this story is one example. Yahoo! financed the investigative reporting work of Charles Robinson and Jason Cole and in turn, they've uncovered a blockbuster story. They have detailed -- detailed -- evidence that Reggie Bush's family took improper benefits from people associated with Mike Orenstein, who I said Bush should have fired some time ago. I didn't know he worked at Mike's marketing firm as an intern, however. But that's for another day. $595.20 in round-trip airfare from San Diego to Oakland in November 2005 for Bush's stepfather, LaMar Griffin, his mother, Denise Griffin and younger brother to attend the USC-California game at Berkeley. The fees were charged to the credit card of Jamie Fritz, an employee of Ornstein. The document detailing the charges was provided by Lee Pfeifer, an estranged business associate of Ornstein's. $250.65 for limousine transportation from the Oakland airport to the Ritz-Carlton in San Francisco that November weekend for the Bush family, charged to Fritz, according to a document. Ornstein acknowledged both he and Bush's family stayed at the luxury hotel. Weekly payments of at least $1,500 to the Bush family. $623.63 for a hotel stay by Bush at the Venetian Resort & Casino in Las Vegas from March 11-13, 2005, charged to Michaels, according to a document signed by Bush. $1,574.86 for a stay by Bush at the Manchester Hyatt in San Diego from March 4-6, 2005, paid for by Michaels, according to a hotel document, a hotel employee and a source. Approximately $13,000 to Bush from New Era to purchase and modify a car, three sources said. As reported by Yahoo! Sports in April, $54,000 in rent-free living for a year at Michaels' $757,500 home in Spring Valley, Calif., according to Michaels and San Diego attorney Brian Watkins. Also from previous Yahoo! reports, $28,000 from Michaels to help Bush's family settle pre-existing debt, according to Michaels and Watkins. Thousands of dollars in spending money to both Bush and his family from the prospective agents, according to multiple sources. If these charges are proved to be true, it could sound the death tone for USC Football as we know it, because the NCAA would have to take away the national championships won by the Trojans Football program, and issue scholorship limits that would harm future recruiting efforts, although Yahoo! 's Josh Peter disgrees with this. When you own the most victories in college football history, the highest winning percentage, the most distinctive helmet and the best fight song, you're not typically burdened with statement games. But sometimes, not even an NCAA-record 31 straight bowl bids, 11 national titles or three Heisman Trophies are enough. Mike Hart is averaging 5.2 yards per carry in 2006.And right now, they are not enough for Michigan. Not this season, and definitely not this week. The Wolverines (2-0) will most assuredly make a statement Saturday at Notre Dame (2-0). The only question is, will that statement be, "We're back," or will it be, "Never mind." Oh, Michigan won't fall from the polls and it won't be eliminated from Big Ten championship contention with a loss in South Bend. But after failing to escape September unbeaten since 1999, it's clearly time for Michigan to say something other than "Uncle" in its first major nonconference test. "We're not just playing Central Michigan; we're not just playing Vanderbilt," Michigan tailback Mike Hart said, listing the Wolverines' victims so far. "It's a game, but there's a lot on the line." What's not on the line in Saturday's meeting at Notre Dame Stadium is respect. Michigan has that, because of its tradition, because of its talent and because it's not likely to finish below second in a (beyond No. 1 Ohio State) woefully weak Big Ten. What this is about for the Winged Helmets is legitimacy. Are the Wolverines all the way back from their 7-5 swoon of last season, when they lost a fourth-quarter lead four times? Or are they bound for another disappointing finish on par with the eight straight seasons that have followed Michigan's last national championship in 1997? Since then, Michigan has gone 73-26. That .737 winning percentage looks great, but there have been no unbeaten or once-beaten seasons in there, and only one two-loss campaign. In the current BCS-blight of a system, that won't get you a national championship. It won't even get you a role in the drama beyond an occasional gig as a warm-up act in some other no-one-cares BCS bowl to whet appetites for the title game. Michigan has always been about loftier goals than that, which is why it heads for South Bend with more to avenge than a losing streak there that dates to 1994. Chad Henne and the Wolverines can make a statement on Saturday. "We want to make a statement that we're not the team from last year," defensive tackle Alan Branch said. There would be some serendipity to the Wolverines' winning at Notre Dame, since the Fighting Irish seized upon their trip to Ann Arbor last season to accomplish the very thing Michigan now craves. That 17-10 victory at The Big House brought a legion of converts to the opinion that Charlie Weis was the right choice to champion Notre Dame's rebirth. Lloyd Carr won't confess to desiring such a seal of approval, partly because he's won enough big games to be secure in his abilities, and partly because he knows he has the administrative support to coach as long as he wants. But a man as proud as Carr knows it's a lot easier to walk in the legendary footsteps of Fielding Yost and Bo Schembechler if 106,000 maize-and-blue critics aren't riding your back every home game. "In a game like this, one of the fun things about it is all the hype and attention," Carr said. "It will be nonstop. That's part of the fun, but it's also a part you have to deal with. You want to go in a positive frame of mind, focused on the things you need to do as a player and a coach to help your team win." For Michigan, those things include a continuation of the rushing success it's enjoyed offensively and the defensive dominance it's displayed rushing the passer. But even those things might not be enough if quarterback Chad Henne can't shake whatever has held him to 135 and 113 passing yards against Vanderbilt and Central Michigan defenses far less talented than Notre Dame's. "This proves how good a team you really are," Hart said. "When Notre Dame beats Michigan, they have a great year. When Michigan beats Notre Dame, they have a great year. It says a lot about how good your team is and what you're going to do the rest of the year. I think we're a good team. But to come to Notre Dame, you're going to find out how good you really are." GREELEY, Colo. -- The University of Northern Colorado's reserve punter was arrested Tuesday, accused of stabbing his rival in his kicking leg. Mitch Cozad, a sophomore from Wheatland, Wyo., allegedly attacked starting punter Rafael Mendoza in a parking lot in Evans on Monday night, Evans police Lt. Gary Kessler said. Mendoza, the Bears' first-string punter from Thornton, was treated and released from the North Colorado Medical Center Monday night. Coach Scott Downing said Mendoza will not punt for UNC in Saturday's game at Texas State University. "I don't know how long he'll be out because I haven't talked to the doctor," Downing said. Cozad, Mendoza and freshman Zak Bigelow had been in a three-way race for the starting punter's job in preseason training. Mendoza has averaged 37.6 yards per punt on nine punts in the two games so far this season. Cozad is facing second-degree assault charges and was scheduled to appear in court Wednesday for a bond hearing. He was suspended from the team, evicted from his residence and expelled from school on Tuesday, The Greeley Tribune reported. Texas cornerback Tarell Brown and backup linebacker Tyrell Gatewood, who were suspended for the No. 8 Longhorns' loss to No. 1 Ohio State, have been reinstated for Saturday's game against Rice, Texas coach Mack Brown said Monday. Misdemeanor marijuana charges against Brown and Gatewood were dropped on Friday, but a weapons possession charge against Brown is still in effect. The pair were suspended after they were arrested with former Texas linebacker Aaron Harris early the morning of Monday, Sept. 4. Brown's attorney, Jamie Balagia, said Harris, who was also charged with misdemeanor marijuana possession, told authorities the marijuana was his. Balagia also said both Brown and Gatewood tested negative on a drug screening for cocaine and marijuana administered by the university. The loss of Brown, a senior and Texas' top cover corner, was keenly felt in the Longhorns' 24-7 loss to Ohio State. Brown had been expected to draw the assignment of covering Buckeye wide receiver Ted Ginn Jr., one of Ohio State's top playmakers, and Ginn had 5 catches for 97 yards and a touchdown in the Buckeyes' win. AUSTIN, Texas -- There are 10 games left before we know for sure, but it's possible that a national championship season started coming into sharp focus on a sweaty Saturday night in Austin. Ohio State's 24-7 punishing of defending champ Texas might do for the Buckeyes what the game in Columbus last year did for the Longhorns. Texas bounced on that September springboard in the Horseshoe and it propelled Mack Brown's team all the way to Pasadena. We'll see whether Ohio State gets the same lift from this game. Anthony Gonzalez led the Buckeyes with eight catches for 142 yards and a TD.There were similarities. The stakes were towering, the game in prime time, the hype immense. The visiting team joyously sang the school song behind one end zone with its celebrating fans, while the home fans sullenly filed out. The quarterback wearing No. 10 in white was the best player on the field (last year Vince Young, this year Troy Smith). The losing team had a playing-time controversy to stew on (last year Smith did not start after serving a two-game NCAA suspension, this year Texas suspended starting cornerback Tarell Brown). And an underappreciated receiver played the hero (last year Limas Sweed, this year Anthony Gonzalez). Will there be a similar boost in confidence for the winner -- a boost that carries it all the way into January? "That's always the hope," said Gonzalez, who had eight catches for 142 yards and a touchdown. "But there's still 10 games left in the season. This isn't easy. "I said after the Michigan game last year, winning the Big Ten is not easy. I can only imagine that winning a national title is twice as hard." It ain't easy, and there are some large land mines in Ohio State's path in the coming months -- notably Iowa on the road Sept. 30 and Michigan Nov. 18. "There's that one at the end," Gonzalez said of the annual blood feud with the Wolverines. "I don't care what happens, that's the hardest game." It's true that this game wasn't terribly hard for Ohio State to win. There are legitimate questions about how good Texas is without Superman in Cleats at quarterback. That VY magic that transformed the Horns from a program that couldn't win the big one into the program that won 'em all? It's gone. Without it, Texas looked talented but flawed Saturday night. After beating Texas, Jim Tressel's Buckeyes are in position to make a title run.The Buckeyes did not have to be great to beat Texas soundly; they merely had to be solid. Many of the questions about Ohio State's rebuilt defense were answered in this game, but the Longhorns bailed out the Buckeyes with some critical errors. And OSU's running game was weak, producing just 79 yards on 29 carries. Bottom line: We still don't know whether Jim Tressel's team has greatness in it. But nobody else has gone into Austin and won by this much this century. Having accomplished that, Ohio State can go down the road to Arizona with as much optimism as any team in America. "It's a big confidence factor to beat a team like this," said cornerback Malcolm Jenkins. "As long as we keep getting better and take it week by week, we could be there." There was no better place on Planet Chinstrap to be Saturday night than here in Austin. This was No. 1 vs. No. 2, and it attracted more star power than the ESPYS. The list of legends was longer than Bevo's horns: Lance Armstrong, LeBron James, Jack Nicklaus, Emmitt Smith, Earl Campbell, Archie Griffin, Eddie George and Cris Carter, to name a few. If you're scoring at home, there are seven Tour de France yellow jerseys, 18 major titles, three Super Bowl rings, four Heisman Trophies and a whole lot of Nike dollars in that group. Unfortunately -- and perhaps inevitably -- the game could not live up to all the buildup. Bucks-Horns II had none of the drama of Bucks-Horns I. The easiest explanation for the drama deficit is the quarterback position. Colt McCoy is a tough guy and a fine player for a redshirt freshman. But this was hardly the spot for a kid playing his second college game to become a hero. Ohio State's edge at the most important position was every bit as pronounced as the final margin. Smith simply continued the magnificent roll he began at the end of 2005. He hasn't thrown an interception since November, and in his last four games he's completed 70 percent of his passes. He's gone from a scrambling type with sketchy accuracy to a master of the position -- and, not coincidentally, he's pushed himself to the front of the Heisman Trophy race. Ted Ginn Jr. caught five passes for 97 yards and a touchdown. Of course, it helps to have the scariest wide receiver in America to throw to. That would be Ted Ginn Jr., who had two explosive plays Saturday -- a 46-yard catch-and-run in the first quarter and a 29-yard touchdown catch to end a sharp two-minute-drill drive just before halftime. But while the eyes of Texas were upon Ginn, they should have at least stolen a glance at Gonzalez to see what he was up to. The hands of Texas' defensive backs rarely touched him. "They were a lot more concerned with Ted than me," Gonzalez said. "Anybody with a brain would have been a lot more concerned with Ted than me." Gonzalez's self-deprecation is as polished as his route running. He's not your typical diva wideout. He's got a shaved head, less as a fashion statement than as an admission of baldness. "If I could [grow my hair], it would be long, I'd put it in a ponytail and it would be jet black," said Gonzalez. Before Saturday, he'd never had a 100-yard receiving game. And before a couple of years ago, his future didn't figure to include any thoughts of playing pro football. "I had a dream to go to Stanford law school," Gonzalez said. "I looked at my GPA and figured I'd better start getting 4.0s." So he did. Now he has twin dreams -- law school and the NFL. But first things first. A national championship chase is under way in Columbus, and got a powerful boost here. "It means a lot," Gonzalez said. "It probably doesn't mean as much as everyone thinks it does." We'll know for sure 10 games down the road. Texas cornerback Tarell Brown had the drug charge against him dropped Friday, but the gun charge remained and a team spokesman said Brown would not play Saturday against No. 1 Ohio State. Brown has tested negative on a drug screening for cocaine and marijuana administered by the university, his attorney Jamie Balagia told ESPN's Joe Schad on Wednesday. Brown was arrested with backup junior linebacker Tyrell Gatewood and former Texas linebacker Aaron Harris. Gatewood and Harris were charged with the same drug misdemeanor. Balagia told ESPN late Wednesday that Gatewood also tested negative for marijuana and cocaine in a university-administered test. Gatewood has been suspended for Saturday's game as well. "He came back clean as a whistle," Balagia said of Brown's test results. "I'm afraid it may be too late to help him play on Saturday, though. I wish Coach [Mack] Brown had waited before he made his decision, but I understand coach was upset that Tarell was out at 3 in the morning. I'll advise Tarell to go make one more personal plea to Coach Brown to play this week." The university will not comment on any drug test results, school spokesman John Bianco said. "I'm just trying to get through Saturday," Mack Brown said Tuesday when he announced the suspensions of Tarell Brown and Gatewood. "As a head coach, No. 1 you have to look at the legal system and cooperate with the authorities completely. No. 2, you must go through the university because that's who we work for. No. 3, you are concerned about distractions for your football team. We want to move forward because it's No. 1 playing No. 2 and it's such an exciting game for all of us. "No. 4, you care about the three young men involved and their families. We will try to help the families individually and move forward with our team for the ballgame on Saturday." Mack Brown did not say if the suspensions would extend beyond Saturday's game. The loss of Brown, a senior and Texas' top cover corner, represents a huge blow to a defensive unit considered the Longhorns' strength this season. He was likely to draw the assignment of covering Buckeye wide receiver Ted Ginn Jr., one of Ohio State's top playmakers. The Longhorns could start junior Brandon Foster or sophomore Ryan Palmer. Foster has played in 22 games and Palmer in 10 last season. Neither has been a starter. Prosecutors said Wednesday they have issued arrest warrants for seven people, including three members of the Colorado State football team, as part of a fraud and forgery investigation dating to last year. "There has been an ongoing criminal investigation since November into bank fraud, and it went to a grand jury in February," said Linda Jensen, a spokeswoman for Larimer County prosecutors. "These are not indictments from a grand jury. These are charges that we have filed." The felony charges range from forgery to theft to identity theft. Coach Sonny Lubick suspended the players immediately pending the outcome of the police investigation. "We take these charges very seriously," Lubick said. "We will cooperate fully with this ongoing investigation. This type of behavior is not tolerated in our program." Lubick said no players would be made available for comment. The charges came as Colorado State prepares for Saturday's showdown with rival Colorado in Denver. The Colorado program has been rocked by off-field allegations over the past few years, ranging from allegations of sexual assault by football players to claims by authorities that alcohol is used to entice recruits to the Boulder campus. The players were identified as Brian Abata, a freshman defensive lineman from Denver; Robert Herbert, a senior cornerback from Alta Loma, Calif.; and Micah Crews, a freshman defensive back from Englewood. Abata and Crews are redshirt freshman, while Herbert, a senior, sat out the spring with a leg stress fracture. Herbert, listed as a backup cornerback on the depth chart, finished fourth on the team in 72 total tackles last season and was named honorable mention All Mountain West Conference. Also charged were Daniel Foster, Calee Jo Chleboun, Tramell McGill and Preston Garcia. McGill was listed in the 2005 CSU media guide as a running back from Chandler, Ariz. He has since transferred to Arizona Western, where he ran for 103 yards and a touchdown Saturday in his school's 14-3 season-opening victory over Pima Community College. Jim Howell, sports information director at Arizona Western in Yuma, Ariz., confirmed that McGill transferred from CSU last season, but he was not aware of the allegations against the sophomore. Foster was a defensive back who played for CSU in 2002, athletics spokesman Gary Ozzello said. School officials declined comment on details of the investigation. "We have been informed that there is a current police investigation involving an unknown number of students at the university," said Anne Hudgens, director of judicial affairs at Colorado State. "We will use any information provided by authorities to determine an appropriate disciplinary response. We also may be limited in the information we can provide to the public regarding these students due to federal student privacy laws." MIAMI (AP) -- Gary Cismesia tossed blades of grass skyward on the Florida State sideline, trying to decipher which way the wind was blowing. Unable to figure it out, he went with the simplest plan: Kick straight. With one swing of his strong right leg, Cismesia put a swift end to 15 years of Florida State's kicking woes against Miami. His 33-yard field goal with 8:01 left put the 11th-ranked Seminoles ahead to stay in their come-from-behind 13-10 win over the 12th-ranked Hurricanes on Monday night. It was the second straight win in the series for the Seminoles, who also eked out a three-point win over their Sunshine State rival in last season's opener -- and took a piece of Orange Bowl sod back to Tallahassee as a souvenir from this one. Drew Weatherford, who was awful in the 2005 win, was solid this time -- throwing for 175 yards, 62 of them on a pair of pivotal third-down conversions that set up the Seminoles' lone touchdown early in the fourth quarter. And Florida State's defense was dominant in the second half, holding Miami to 17 yards. "In this series, it's been defense, defense, defense," Miami coach Larry Coker said. "Our defense has won in the past at times. But not tonight." That this year's Florida State-Miami game was a defensive battle surprised only the boldest of prognosticators. But the degree to which both offenses struggled Monday night could not have been foreseen by many. Here are the rushing stats, or lack thereof, from FSU's 13-10 season-opening win. Michael Ray Garvin intercepted Kyle Wright's final pass with 29 seconds left, sealing the victory. Florida State's offensive hopes almost entirely hinged on the passing game, since Miami's defensive front held the Seminoles to 1 yard on 25 rushes. Still, even a performance like that wasn't enough to carry the Hurricanes, who wasted a 10-3 halftime lead. "You don't know how hard it is to beat Miami," Seminoles coach Bobby Bowden said. "I mean, I've been playing these guys for 31 years. They've probably got as good a defense as there is in the country, unless it's us." Charlie Jones had a 4-yard touchdown run for Miami, which hadn't lost to Florida State in the Orange Bowl since 1998 -- and has now lost three of its last four games overall dating back to last season. The revamped Miami offense struggled mightily; Wright was 18-of-27 passing, but gained only 132 yards. And the rushing game, like Florida State's, was nonexistent: Miami had 2 yards on 26 carries, the second-lowest total in school history. Miami peeled off eight straight wins after losing to Florida State in the opener last year, ascending to No. 3 in the polls. Now, the Hurricanes -- who could see the Seminoles again Dec. 3 in the Atlantic Coast Conference title game in Jacksonville -- will need to dig out of an 0-1 hole once again. "This is something that's going to test us," Wright said. "A good team's going to stay together and see them back in Jacksonville. And right now, we have to move on. We have to put it behind us." Joe Surratt had a 1-yard touchdown plunge for Florida State on the first play of the final quarter, and De'Cody Fagg had three catches for 60 yards for the Seminoles. Darnell Jenkins and Lance Leggett each had four catches and combined for 93 yards for the Hurricanes, but the duo made only one catch in the second half. "They wanted it more than us and they showed it," Jenkins said. "We had the game in our hands." Thanks to Cismesia, FSU kickers past -- Gerry Thomas, Dan Mowrey, Matt Munyon and Xavier Beitia -- may finally feel some relief. Each missed pivotal chances late in games against Miami in recent years, a trend that long befuddled the Seminoles. Thomas missed in 1991, Wide Right I.
Mowrey missed the next year, Wide Right II. Munyon's miss was in 2000, Wide Right III. And Beitia missed three in his career against Miami -- wide left at the end of the 2002 game, another in the 2004 Orange Bowl loss to Miami, then a block in the Hurricanes' 16-10 win that opened the 2004 season. But Cismesia -- who missed an extra point and then two field goals in overtime against Penn State last season in the Orange Bowl -- delivered. "It's the best feeling I've ever had in football," Florida State linebacker Buster Davis said. "This is our stadium." Weatherford -- now 2-0 against Miami as a starter -- had third-down passes of 28 and 34 yards on a third-quarter drive to breathe life into a stagnant offense, setting up Surratt's score that pulled the Seminoles into a 10-10 tie. About 7 minutes later, Cismesia came through. And the Seminoles hung on. "It just shows character on the part of the whole entire team," Weatherford said. A close game shouldn't have surprised anyone at the Orange Bowl -- this marked the seventh time in the last eight meetings between the schools that the outcome was decided by eight points or less. Cismesia hit a 37-yard field goal 6:04 into the game, opening the scoring. Miami's first scoring drive was highlighted by a 27-yard catch by Jenkins, who adjusted and spun to grab a slightly underthrown ball shortly before Jones' touchdown run with 13:02 left in the half. Jon Peattie added a 20-yard field goal later in the half, pushing the margin to 10-3. Miami's Brandon Meriweather had an interception shortly before halftime, giving the Hurricanes the ball at Florida State's 31 -- but the offense couldn't extend the lead, and that missed opportunity proved costly. AUSTIN, Texas -- Texas senior starting cornerback Tarell Brown was arrested and charged early Monday with misdemeanor drug and weapon charges, leaving his status in question for the No. 3 Longhorns' matchup with top-ranked Ohio State. Arrested with Brown was backup junior linebacker and special teams player Tyrell Gatewood, and former Texas linebacker Aaron Harris. Brown was charged with unlawfully carrying a weapon, a loaded 9 mm handgun, and Class A misdemeanor, and possession of under 2 ounces of marijuana, a Class B misdemeanor. Gatewood and Harris were charged with the same drug misdemeanor. The gun charge carries a maximum penalty of one year in jail and a $4,000 fine. The drug charge carries a maximum of 180 days in a jail and a $2,000 fine. Brown and Gatewood were released on personal recognizance bond and Harris remained in the Travis County jail Monday afternoon. Texas (1-0) and Ohio State (1-0) play in Austin on Saturday night. In a prepared statement, coach Mack Brown said he met with both players and was "holding them out of all team functions as we gather as much information as possible before making a team decision." According to the arrest affidavit filed by Travis County deputies, the three were in a car Harris was driving on Interstate 35 about 2:50 a.m. A deputy pulled the group over after watching the car weave erratically and nearly strike another car. According to the report, Harris got out of the car when pulled over and Brown and Gatewood were asleep. Harris passed a field sobriety test but told the deputy he had been smoking marijuana and there was "some" in the car. When deputies approached the vehicle they saw Brown, who was sitting in the back seat asleep, with his hand on a gun in his lap. The officers also reported finding a marijuana "blunt" under the front seat and charged all three with possession. Only Brown was charge with a weapons violation. A call to Brown's attorney, James Balagia, was not immediately returned. If he is suspended, it could be a huge blow to a defensive unit considered the team's strength this season. Brown was likely to draw the assignment of covering Buckeye wide receiver Ted Ginn Jr., one of Ohio State's top playmakers. Defensive co-coordinator Gene Chizik said the team would not be distracted by the arrest. "This team is very focused," Chizik said. "One thing that's awesome about the University of Texas, you have opportunities to have great depth." Several Longhorns players declined comment at the team's weekly news conference. A second-year starter, Brown has 127 career tackles and three interceptions. He broke his arm in the second half of the Rose Bowl last year and had six tackles in a 56-7 win over North Texas. Mack Brown has suspended a starter charged with a misdemeanor in the past. In 2003, standout running back Cedric Benson was charged with criminal trespassing and missed a game at Baylor. Before the Rose Bowl, running back Ramonce Taylor and defensive back Cedric Griffin were questioned by police in an assault investigation but neither was ever charged. Both played in the game and played key roles in the 41-38 win over Southern California. Gatewood was a former wide receiver before switching to linebacker this season. He made one tackle on special teams against North Texas. Irish head coach recaps Saturday's win at Georgia Tech. COACH WEIS: I think our kickoff return, which was one of our points emphasis in the off-season, which had not been very good last year, obviously we had two big ones last night, averaged 39 and a half yard a return. That was very good for field position, not that we capitalized. I think the fact that we had two big returns out of two different players bodes well for all the time we spent in the off-season. On the negative vein, I thought our punt protection left a little bit to be desired. We have some work to do there. Jeff got the ball off quick, which kind of made up for some of that. I think Zibby could have made a couple better decisions on those punt returns. I talked to him about that yesterday, catching the ball on the five yard line. One time we got pinned back there on the five yard line. We got to be smarter about that. Carl obviously missed the two field goals. That goes without saying. We had two penalties, one on the first drive. The fourth-down play, when Thomas was false started. That ended up being the third penalty in the first possession, throw in the two offensive penalties, add the special teams penalty, about how we went on the penalty mode. The only other penalty, they called Sergio on the one pushing the back. Sometimes people forget about the hidden yardage in a game. Well, there's hidden yardage that was significantly lost on that play because not only do you get the penalty on him, but then the return yardage. That was our best return of the night. You end up losing that yardage on top of it. That ended up being a 30-yard penalty instead of a 10-yard line penalty. The one cover guy who stood out the most to me was Casey Cullen. He was in on a couple tackles. I thought he played well on all our teams. Then we go to defense. There's a lot of positives here. The first thing out of all the positives after going over it with the defensive staff is from the players, the entire night we had two mental errors. That's just unbelievable. Going through an off-season where one of our main objectives was to cut down on mental errors, let the players know what to do, to have only two in the game is just unbelievable. We can throw a third one in there on the coaching staff, the one time we get a call in there late. Fortunately, they didn't take advantage of it when we weren't lined up. Threw the ball out to the left, we weren't lined up yet, we're uncovered. First game jitters as far as that stuff goes with communication, but for the most part, I thought the communication for the game, both from the players and coaches, was outstanding. In the second half, a couple significant points of note, they were 0 for 4 on third down in the second half. They were 2 for 10 for the night for 20%, but they were 0 for 4 in the second half. While you're on the second half, in addition to that, No. 21 guy, who had had pretty good first half, he had two catches for 16 yard in the second half. He basically was shut down, and on top of it, we gave up no points in the second half. They made a couple runs, quarterback runs, which we're going to continue having to work on because last year was an area of concern. Ball made a few plays for them last night. We were a little late on a couple of our pressures, which led to a couple productive plays from them. But really the two big passes they get in the game both led to their two scores. I mean, Calvin takes the one ball, the little swing pass, takes it 25 yards or whatever it was. That leads to one score. The other one, when we laid up on Darren, jump-ball situation, that led to their other score. On defensive, we had no penalties, okay? You have two mental errors and no penalties in play with that type of emotion, get off the field on third down, that's usually going to bode well for your defense. On offense, let's talk about the positives before we get into the negatives. We didn't turn a ball over, which was one of the critical factors going into the game. They didn't turn it over either. But no turnovers keeps you from giving away the game. The significant part of the game besides the end of the game where we got the ball pinned back on our own five yard line, we went in there and calmly ran off 29 on the clock, went on an 11-play drive to ice the game. Really the critical factor is where we went on a 14-play drive right before halftime to score. Then we get the ball, the first drive of the second half, we go on another 14-play drive. What then happened, any of the of defensive guys who were tired at all really hadn't been playing for over a half hour of real-time. You had the whole 14-minute drive, then halftime, then another 14-minute drive. We had a lot of gas in our tank towards the end of the third quarter and into the fourth quarter. A lot of it had to do with those couple of drives. Now, on the negative side, we had nine penalties called on us in offense. We had 11 in the game, but nine in offense. Six majors and three line-of-scrimmage penalties. None of those line-of-scrimmage penalties had anything to do with the noise. All of them had to do with guys getting antsy and not being patient and just holding in there. In hindsight, after looking at all those penalties, I think they were all penalties. Some of them were the penalties, but watching them on tape this morning, looking to argue with the officials, which I always like doing, I think looking at all of them, I could see every one of them that they called. But six majors and three minors will be unacceptable and will not be tolerated. It will be addressed here shortly this afternoon. (Indiscernible) was under a little duress. He didn't play great. He was pressured about 10 times between that and a sack -- I guess they gave him a sack with intentional grounding, too, which turns into two sacks. Third town we weren't great. We were 7-16. Really looking at the analysis of that, you're 50% on the real yardages, but when it comes to third and 10-plus, which I talked about after the game last night, we were one of five, that was a quarterback scramble. That's not how you want to play the game at third and 10-plus. We had way too many mental errors, where we had two on offense, we had double-digits -- I mean, two on defense. We had double-digits on offense. You had a couple mental errors, about 10 pressures, throw on top of that nine penalties -- you want to know why you score 14 points, I could sit there and tell you we had almost 400 yards of offense, 21 first downs. You can go right down the line. The bottom line is when you do things like that, you're not going to score a lot of points. It's fortunate in this game that the defense came through and that Jeff did such a good job getting us out of trouble when we had to get out of trouble. Last but not least on a note before I open it up for questions, two things, one specific to the game, one more general to this week, I thought that our team was in very good condition. I thought it showed in the second half. I thought that watching at the end of the third quarter going into the fourth quarter, even though no more points were scored in the game, I thought our conditioning was exceptional. I think that's one of the things I'm going to address with the team today. On a side note, not related to last night's game, but weather permitting, this week, due to obviously this is the first time I'll ever be able to say anything about Penn State now that Georgia Tech is done, but weather permitting, we're going to try to have this pep rally in the stadium on Friday night so we don't turn anyone away. Just like the game last year, the USC game, where so many people wanted to go, weather permitting we'll try to do that. As long as the weather holds out, no one will get turned away. John and I talked about it. We figured, let's get that out there now so people know what our intent is now as long as the weather holds up. THE MODERATOR: Questions from people here in person. COACH WEIS: What happens is, we talked about two major issues going into the game. One was doubling 21. The other one was loading up on the run. You got to pick your poison because you really can't do both of them at the same time. If you're going to put two guys on 21, then you're going to have to play even-steven with everyone else. You leave yourself a little bit more vulnerable. I think for the most part when you give up under a hundred yards in the second half, which they did, averaging about three yards a play, which they did, I mean, I think they obviously made good decisions on when to do which because it's tough to do both. When you have a guy, a front-line receiver like that, you have to give him special attention. You have to find that happy medium, when to pay attention to the receiver, when to pay the attention to the running game. But that leaves you open for more with one-on-one potential failures, like you're talking about, where there's some openings in, especially the inside. Whether you call it freeze option or the wide-open shotgun version of the inside zone play. COACH WEIS: I would like to think the two major things coming in, you know, human nature, we can say these kid don't hear everything that the media says, but they do. It's human nature. For half a year to be told how crummy you are, I mean, these guys have a lot of pride. I think we addressed it in the off-season. The first thing we wanted to make sure, we wanted to make sure the players knew what to do, so this way they could do it full speed. I think that showed up last night. I think that's going to be the continued philosophy, that we have to see if we can grow from this. COACH WEIS: I think most of their game was played in what we call 11 people, which is one back, one tightend, three wide receivers. That was most of the game. Now, they did play some, what we call, regular people or 21 where they had two backs in the game, a tightend and two wide receivers. A lot of the game was played that way. Last year, you're right, we played a lot of that which definitely leaves you exposed, specifically in the passing game. I think we had more DBs on there than five last night, too. There were times that we went all the way to six DBs. We might have even gone to seven one time, but -- I know we had a seven DB package in. I think we have more guys that we're not afraid to put on the field. COACH WEIS: I definitely would say that we have -- if the problem were all coming from that right tackle, that freshman right tackle, then you can say it came from the freshman right tackle. But he actually played pretty good, okay? The problem for me was that's not where all the problems were coming from. That's where there was more disappointment. It was coming more from my veteran guys than from my rookie. I thought he actually held up fairly well, to tell you the truth. Would you say that was disappointing? Yes, I'd agree with that, that that was -- that I was disappointed with the overall play. I think not that, you know, I had guys laying it down. I just thought we were very inconsistent along the front, which was about how we played on offense. You know, the logical thing to say, what a lot of people would say is, Well, it's the first game. That's a bunch of crap. I mean, the first game, you should expect to play a lot better than that. To tell you I wasn't disappointed, to say I wasn't disappointed, would be a lie. Q. You touched a little bit on Brady's play. Can you talk more in detail about his game last night. COACH WEIS: Well, I mean, first of all, the guy made some plays to help us win the game, some critical plays. And he got hit multiple times in the game. I mean, he's a tough guy, made some plays. There's a lot of plays you'd like to have back. To be honest with you, I am glad he's got that game behind him. Ended up being a win. He was able to engineer the two touchdown drives, make a big third-and-nine in that last drive of the game, hit that completion to Rhema on an end-cut to help buy us the game. There were a lot of positive plays in the game. No one is a bigger critic of Brady than Brady. He'll come in today, he'll be so far in the tank, I'll have to spend a whole day getting him out of the tank. I'll be dragging him out of there because his expectations for his play are so high. Are there a lot of plays that he'd like to have back? Yes. Once again, I can go be a stat guy. He's 23 for 38, we drop about six balls. We catch those balls, he's 29 for 38, no one is saying anything any more. But the facts are, that's not the way it was. There's a lot of plays in that game last night he'd like to have back. Q. You talked about your conditioning. Did it seem to you maybe all the blitzing Georgia Tech did early maybe took something out of them for later in the game? COACH WEIS: I think they play with a very high level of intensity. I think when we tweaked -- in the middle of the second quarter when I kind of went off the game plan, I kind of said, okay, we're going to have to call somebody just to get these things run the right way. So from the middle of the second quarter through the third quarter, we got into some things where we felt that we could not get us in those third-and-long situations that we were getting ourselves in for a quarter and a half, which I thought was killing us. Every time you turned around, it was third and 12. I thought that was killing us. I just said at halftime, we're not going to be playing the game at third and 12. We may not convert, but we're not going to be third and 12. Q. You talked last week about perfect plays, games. How far were you from that last night (indiscernible)? COACH WEIS: No, as a matter of fact they played very well on defense, but they did what we thought they would do. We also had done a lot of study of our Ohio State game, realizing that's the latest piece of information they could have going back to the Fiesta Bowl, watching. Some of those things showed up in the game, too. I think we were fairly well-prepared. I just thought that our execution was just a little sloppy there. The first part of question again? Q. Were you able to carry that out? COACH WEIS: Until you get to third and 12. Really, I mean, the script was going as play one, play two, play three. I mean, I got down to about play eight of 15. I picked it up the next drive. You know, now you're getting a first down after a few plays, then all of a sudden you get another penalty. Those penalties are usually drive killers usually. You can overcome some of them, okay? But when you have nine penalties in the game, you usually have some serious damage control to do to overcome them. COACH WEIS: Well, it was a run-pass check with me, okay? It was a run-pass check with me. When you go to the line of scrimmage, if it was bring the house, which I thought there would be a good chance they would be bringing the house, we would have been throwing the ball. But he goes to the line of scrimmage. You can very clearly see that they were in a zone coverage where they were going to double receivers. There was going to be two high safeties and no one in the middle. The only guys that could end up possibly making a tackle on him were the mike linebacker on the tight end, and the will linebacker over on the X. There was a big cavity in there. We had talked about it right before the play. If in doubt, throw the ball, then we'll kick a field goal if we don't make it. But he got the look that we thought we would get. That's why we called it a run. Any time we call a run-pass, we like to run it first, okay? He got the look and scored. It really wasn't that risky based on what the look was. On the third-and-long, that was him doing it on his own. What ends up happening, when they start doubling on the wide receivers, you break your team, there's no one out there. I just want to make sure when it comes time for contact get the first down and go ahead and get down. I'm not looking at him being a hero. I'm not looking for Randall Cunningham to be a hero. First down, go ahead and get down. Q. (Indiscernible) your defense was playing so well from the half. COACH WEIS: Agreed, okay? But the last time we had a plus-50 punt, we kicked it into the end zone for a touchback. We just hit a plus-50 punt not too long ago, kicked it about five yards deep in the end zone. So here is my thought, okay? Our defense has played great, played great the whole second half, okay? We're only up four because we missed a couple field goals. So if I punt the ball into the end zone, they get the ball on the 20 yard line with a minute to go in the game. Let's just say they hit 21 at a crossing rout, he takes it to the house. Here the spirit of the defense who has played so good the whole game, okay, is broken because I didn't have the guts to go for it on fourth and a half a yard. That's why I went for it. Q. How much did you have to really think about it? COACH WEIS: I never thought about it. As a matter of fact, I'll give you a funny story. My wife was at the game. She's upstairs there with a group of people. She goes, He's going to go for it. They say, He's punting it. She goes, Oh, no, he's not (laughter). Q. Giving the way the game went, getting behind early from miss-kicks, sloppy plays, is there a scenario down the road where you're having this (indiscernible)? COACH WEIS: No one is happier than me that I have this type of information to use today. Would I have liked to win by a whole bunch of points and have an easy victory in? Absolutely. Let me not be a hypocrite. With that being said, these games all count as one. Everyone counts as one. No one is going to care two weeks if now what the score of the Georgia Tech game was. They're going to care for the next 48 hours. They're going to care for the stories on Monday, the stories on Tuesday, then it's going to be all about Penn State. From my standpoint, look at all the positives that I can take out of that and look at all the negatives that I could work with with the players today. As I said to everyone last night, it's a heck of a lot easier when the guys are feeling good about a win to tell them all the things they did wrong because they're in a psychological frame of mind where they're more open to constructive criticism than when if they had lost 17 of 14, and now all of a sudden you're doing the same criticizing, but now everyone's in the tank. I think this will be a very good teaching take for us. Q. You talked about being pretty confident your team had the right mentality, they were disciplined. Are you at all concerned about the way your line played, given the penalties? COACH WEIS: Was I concerned? I'm disappointed. I know that we'll play better. I would be more concerned if the things that I saw on tape were not correctable. That would be a concern. If I say, Hey, we didn't know what we were doing. Hey, why did we do that? There are several things in there that I -- there's several things I think you'll see a drastic level improvement in one week's time. Q. (Indiscernible) after you watched the tapes, did you learn something more about how Travis Thomas played? COACH WEIS: He actually played pretty well. I was not surprised because I don't study the game as the game's going on on defense because I'm multi-tasking when we're on defense. I'm talking to the defense. I'm flipping over to the offense. I'm getting a rundown of the previous series. I'm thinking about openers for the next series. Staying in touch, knowing what the defensive calls are. Obviously, I'm following along with the down and distance and the calls, but I'm not really seeing on the first play of the game the tackle by Travis Thomas. I'm not seeing on that sideline run over by their sideline, he runs from one side to the other side, knocks the guy out of bounds with a physical play. I'm not seeing -- I'm not sure for a fact that on that sack, where he's on block now, then they can call it a tackle for a loss and say it was an option all they want, but it's a sack to me. Any time you tackle a guy for a five- or 10-yard loss, it's a big play for me. He definitely showed us somebody is running around very well. At the end of the game, when Darius needed the blow, I thought Darius played outstanding, that was the guy on offense in the second half you knew you could count on, give the ball to 3, because that really was the difference maker as far as offense goes, but when he needed blow, throwing him in there when it came to a pound-it mentality, I thought he helped us win the game there, too. Q. He said he was even surprised how much stamina he felt he had at that point. Did he surprise you with that? COACH WEIS: He surprised our whole staff because the guy who I had monitoring him was Brian, because he's playing on special teams, he's playing a linebacker, then I'm throwing him in the game. Every time he came off the field, he was checking on Travis. Remember, that's the first time in a while Travis has played this many plays. He's been backup to Darius now. He hasn't played this type of volume of plays. I'd say that his play -- I mean, he's still in a learning curve because it's new to be out there and playing at this level right there, but I think you'd have to say he held up pretty well for his first rattle out of the box. COACH WEIS: We know that Darrin Walls has cover skills. We knew that before we got him. The one thing he's going to learn, now he's playing with big boys, not playing with a bunch of high school kids more. That kid he was going against when he was out there, everyone sees the one play, but that wasn't the only play that was lined up against him. Everyone sees the one play for 40 yard. He didn't see the rest of the plays when they were there with him, too. He's out there for a while, especially in the second quarter. He played a whole bunch. I think you start learning, now all of a sudden you can't get by with just athletic ability alone any more. Now you have to really be sound fundamentally and technically or else these guys will go ahead and make a play on you. COACH WEIS: Well, I know that he was a little bit -- you know, during this whole thing, he was a little bit uncomfortable just with the unknown, not with being able to call the game from there, but just the unknown after not having been there for two decades being upstairs. Being on that phone and listening to the communication, listening to how everything went, then just listening in the third quarter where we started to get a bead on what they were doing, I think it was a have he good start. THE MODERATOR: We'll take some questions from the phone. Q. Did you feel the defense, part of it was they were picking up halftime adjustments better than last year? COACH WEIS: This is the first time out. I think the things that we did -- the things we started to do in the second half were things that we had in the plan the first half, we just didn't do them as often. I think the coaching staff and the players did an excellent job of that in the second half. Q. Is this now a matter of having to rebuild Carl's confidence a little bit? COACH WEIS: Well, we started to work on that. I started working on it in the locker room last night. I think the most important thing is when you can sit there, kick an extra point, kick field goals in practice, you know you can kick them in the game. You just got to be able to kick them under duress. That's just the way it is. We'll keep working on it. I'm not throwing in the towel on anyone. I mean, it's the first game. You got jitters. That's not making excuses. The team's still counting on him making them and he knows the team's counting on him. Q. Talking about how challenging the scheme was with Georgia Tech. Why tonight more teams do that? Do they not have the personnel to be able to do that? COACH WEIS: If I heard you correctly, they talked about their scheme and why don't more teams try to get into scheme and blitz zones, is that right? Is that what your question was? COACH WEIS: It was broken up, that's all. I think there's multiple teams that we play against that have a heavy dose of blitz zones, multiple teams. It's one of the things that's en vogue in defense right now. It's en vogue in the NFL, it's en vogue in college. It's just one thing you have to get ready for on a weekly basis. The big difference with Coach Tenuta and a lot of other coaches is that that is like a base defense for him. It's not change-up defense for him, that's like what he does as his base. Let's bring it and bring it and bring it. That's part of his mentality. I think any play-caller, whether it be on offense or defense, it starts with your own personality. His is to keep on bringing pressure. Not everyone thinks like that. A lot of people think fire zones are things you use as a change of pace, not as a mainstay. Q. Can you talk about Ndu's play why yesterday. He got beat a couple times, and he seemed to recover then he was right back in there. COACH WEIS: I think there was only a couple plays that I saw him mess up. They were the ones like when he was filling in the alley, at 21 made a miss. I know one time he went up the sideline. He made a bunch of plays out there last night. I know he had at least, oh, five or six tackles. He had that pass broken up where he knocked them really good, knocked the ball loose. That would have been a big gainer. I think he was running around as good as I've seen him run around. I'm not saying he was perfect, but I think the dropped weight really paid off for him last night. His stamina was good. He wasn't sucking wind. I thought he made some plays out there. Q. Can you talk about at what point where you said, this defense is really getting it now, these guys have shown some improvement from last year? COACH WEIS: I think right off the bat I'd have to say the first drive of the second half, when it's 10-7, we're kicking off, they get the ball, now all of a sudden they kickoff, the defense stops them right off the bat, we get the ball back, go down and score. Now all of a sudden the complexion of the game has now changed. I felt the rest of the game that, even though there were a few plays being made by their offense, I felt the defense started to control the game where I never felt like I had to go into a more aggressive mode offensively. A lot of people have started to, well, what are we going to do now? I think because of how our defense was playing early in the third quarter, right on through the second half, allowed me to just keep on doing what we're doing and nickel-and-diming them. Q. Can you talk about maybe the adjustments you have to make for Penn State, what kind of offensive challenge -- what they have offensively? I know you've done the homework on all the teams. COACH WEIS: We watched all their games from last year. We watched some of their games from last year. As a matter of fact, the coaches as I'm talking to you right now, they're watching their game from yesterday, breaking that game down. I'm going to wait till Tuesday to talk about Penn State. Q. I wanted to ask about the game last night. You were talking about the key, the third-and-nine pass, the commentators were talking about the guts that you had to make that call. Do you consider that a gutsy call? Is that one that, hey, it's in our offense, that's the best way to get a first down, let's go with it? COACH WEIS: I choose the latter, not the former. I'm with you. I think I had the ball, I had a protection that gave the quarterback time to throw the ball. He knows knew what his reads were on the play. The only question mark which somebody raised last night, I don't remember who, if you throw an incomplete pass, you're not using as much time at the time. But I was trying to win the game, not play to not lose it. I usually coach the game to try to win the game, not to not lose it. Fortunately or unfortunately, I'm going to have to live and die with that mentality because that's the one I have. THE MODERATOR: Back to here in the room. COACH WEIS: Well, (indiscernible) was on the field for 20 plays last night. The ball didn't come his way. We don't plan plays to get to a specific receiver. Like a lot of offenses, they say, how many ways can we get the ball to so-and-so. We call plays based off of whether it's a progression or coverage read on the play. I mean, he's in there 18 plays. There's 10 passes thrown. It's possible that he gets 10 balls thrown his way. It's just based on the coverages. Last night the balls weren't coming his way. And then George, he's right there in the mix right below that tier, playing time on offense. Right now, I think those guys playing up there ahead of him are pretty good. They're going have to wait their time and earn their stripes.